The poor Brussels sprout can't get any respect. First, nobody wanted to eat them. Now, people have discovered that Brussels sprouts can be delicious but all they ever do is roast them for a measly side dish. Well, here's a star turn for Brussels sprouts in this vegetarian pasta recipe. 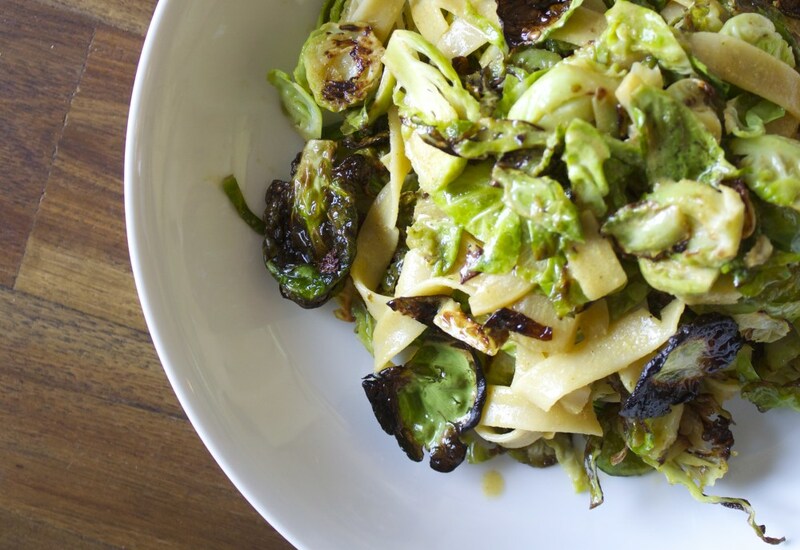 The sprouts get sliced and sauteed until they're soft, then tossed with garlicky fettucine. This way the sprouts kind of melt into the noodle strands for a delicious, satisfying main course. It's time that Brussels sprouts made it off the side lines and became front and center in your meals. Nutritional yeast has an unappetizing name but it's actually quite tasty, in addition to being good for you. It's often used as a vegan substitute for an aged cheese, like parmesan, because it has a similar flavor profile: nutty, savory, and, well, cheesy. Look for it at health food stores and good supermarkets. Per Serving: 537 calories; 19g fat; 76.2g carbohydrates; 20g protein; 31mg cholesterol; 777mg sodium. I made this recipe the other day and really enjoyed it! The Brussels sprouts and nutritional yeast adds really good flavors. It's is such a light dish too, which is a plus. Sometimes I crave pasta, but not all the heavy cream and sauce. This recipe is the perfect median. Brussels sprouts and pasta are a winning combination! Next time I may try it in a cream sauce. This was really good. So, I pan fried bacon and chopped it up. Then, I pan fried the Brussels sprouts in the bacon grease. I tossed both the sprouts and the bacon with the fettuccine and topped it with grated Parmesan. So amazing! I thought this recipe was a little bland, so I added a creamy garlic sauce to the fettuccine, which made a huge difference. It pairs perfectly with wine for a quick and easy weeknight dinner. Sooo good. Made this using linguine noodles instead of fettuccine. I didn't use nutritional yeast, but instead shaved parm. Love it!